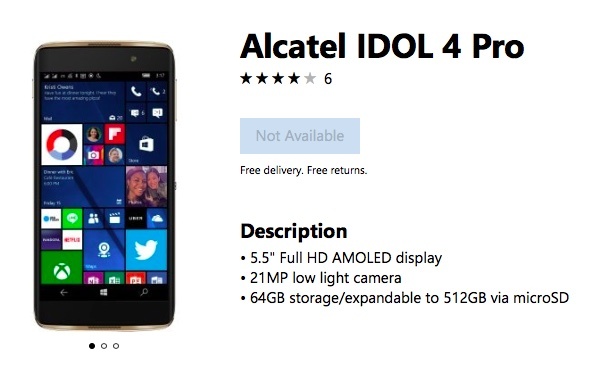 Nine months after it came on sale in Europe (remember, the nigh-identical IDOL 4S came out a year and a half ago in the USA), the Alcatel IDOL 4 Pro is finally sold out on Microsoft's UK site - though still available in France and Germany. The recent price drop to £320 will have helped clear stocks, of course - there are still people who want a Windows 10 phone in 2018. The Microsoft France and Germany sites still have stock and at a pinch you could buy from there and just switch the device's start-up language to English, but of course you'd have a few hurdles if the hardware went wrong, plus you wouldn't get a UK mains charger (not that this is an issue). I guess the IDOL 4 Pro stock had to run out at some point - I wonder how many were made in total? I'm guessing a hundred thousand, with the UK site getting about 30,000? Something of that order of magnitude, I think. All small numbers in the grand scheme of things, mind you. All of which leaves just one Windows 10 Mobile smartphone still for sale, and it's not high end (though don't write it off).